If you have just started your portrait photography business or are planning to start it soon, you may have come across advice from other photographers in the industry. They may have told you to narrow down your ideal client. That makes sense, but all you can think about is how you’d want ANYONE to pay you for your photography services right now. Perhaps you’ve heard that building a business is all about word of mouth referrals. Yes, that is a big part of building a business! But when you are first getting started in your photography business it takes time to build up that client base that will send referrals your way. I remember hearing all of this advice myself. But when I was only three months into my portrait photography business, I did not have enough clients to sustain my business through word of mouth. Nor did I know how to narrow down my ideal client because I just wanted to get paid to do what I loved. I needed a way to generate bookings and get my photography business off the ground sooner than later. Well, friend, as a photographer who was in your shoes only a couple years ago, I want to let you in on my biggest secret for building my photography business quickly! Mini sessions. Yes, you heard me right, I did say that mini sessions are THE number one reason I built my photography business as quickly as I did. Now how fast was that? Well my I started my business in June of 2016. Those first six months in business I made $5K in revenue. The next full year in business, I made $36K in revenue. I give mini sessions and hard work the credit for the number one way I increased my revenue, built my brand and eventually built a base of wonderful clients who continue to refer their family and friends to me this very day. You may have a different image in your head of what mini sessions are, so I wanted to outline what a mini session is to me. Mini sessions are a block of time during a day where I can schedule a bunch of shorter photography sessions back-to-back. The advantage of mini sessions is you can offer a lower price point, fit many sessions into one day and only have to drive to your location once. And let me tell you a secret: for some reason, when you announce the words “Mini Sessions”, families come flocking – they just love them (and I love them too!). Almost 90% of my mini session clients are families, but I do get some couples sprinkled in here and there. Even if you don’t want to focus on photographing family portraits forever (currently I focus more on couples but I still photograph families in off-season) usually when you are starting out, you are willing to shoot anybody and everybody who is willing to pay you money. My outlook and mindset when I started my business was I want to be out there photographing people, gaining experience and getting paid to do it. It was really important for me to show that I was serious about my business and therefor working hard to photograph all these people. Even if families aren’t your end goal to photograph, just think of how many connections you are building when you photograph these families, give them a killer experience and a reason to refer you to all the people they know. If you want to focus on newborns, hello! Families are the ones that most often create these new human beings! 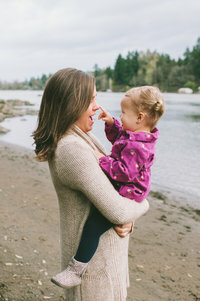 Connecting with families through mini sessions could lead to them to asking you to be their newborn photographer the next time they’re expecting. Families know everyone! They know other moms looking for family pictures. They know families who have children in high school who may refer you for senior pictures. Mom’s know other moms who’s daughter or son just got engaged and need an engagement or wedding photographer. The referral possibilities are endless when you start photographing families. I remember the first time that I did mini sessions, I immediately got referrals for photographing other families. I got a referral to photograph a senior in high school. I got to photograph an extended family session for one of my mini session families. Even this year, two and a half years after photographing a family at my first ever mini session, they asked me to photograph their newborn baby girl. Also, families typically like to update their pictures every year for Christmas cards, so the amount of repeat business you can gain through mini sessions is impressive. Mini sessions can be held anytime of year – especially if you live in a temperate climate! If you live somewhere that experiences cold winters that are not ideal for little kids’ fingers and toes, don’t worry. Find a local photography studio that you can rent by the hour. You can host Valentine’s Day mini sessions in February, Easter mini sessions in March or April, Mother’s Day mini sessions in May, fall mini sessions in – you guessed it – the fall! You get my point, the possibilities are endless! I promise that if you host mini sessions, you give your clients an amazing experience and you keep on doing them, your business WILL grow! I hosted many days of mini sessions for families, I gave them an amazing experience, I over-delivered on my promises and I communicated in a thoughtful way so those families without a doubt knew who to recommend the next time they heard of someone in need of a photographer. You can do mini session. You can grow your business! Hey, it’s me, Larissa! I started my photography business three years ago with a one-day photography class, a craigslist camera and zero experience photographing people. I’m not a hot shot in the industry, but a real person who built a business that replaced my previous job’s income and a fire in my soul to share how I got my business off the ground with other newbie photographers. If you want more advice, how-to’s and tips on getting your portrait photography business off the ground, head over to my photographers’ page!